Thomas de Hoo, knight, and Isabel, his wife, have given, granted, demised at fee farm and confirmed to William Notte of the parish of Hurstmounceux [Herstmonceux, Sussex] 1 messuage and 3 acres of land lying in the parish of Hoo [Hooe, Sussex] which is called Nottyslond'. To hold to William, his heirs and assigns, doing for Thomas and Isabel, their heirs and assigns, to the chief lords all services, and rendering yearly 12 pence in the name of fee farm at 2 terms, namely 6 pence at the feast of Easter and 6 pence at the feast of St Michael. Thomas and Isabel, their heirs and assigns, shall have the right to distrain. Warranty and defence by Thomas and Isabel and their heirs. Witnesses: Gilbert Adam, Geoffrey Palmer', John Thomas, Richard Godewyne, John Edryth'. Given at Hoo on the 6th day of May, 46 Edward III . 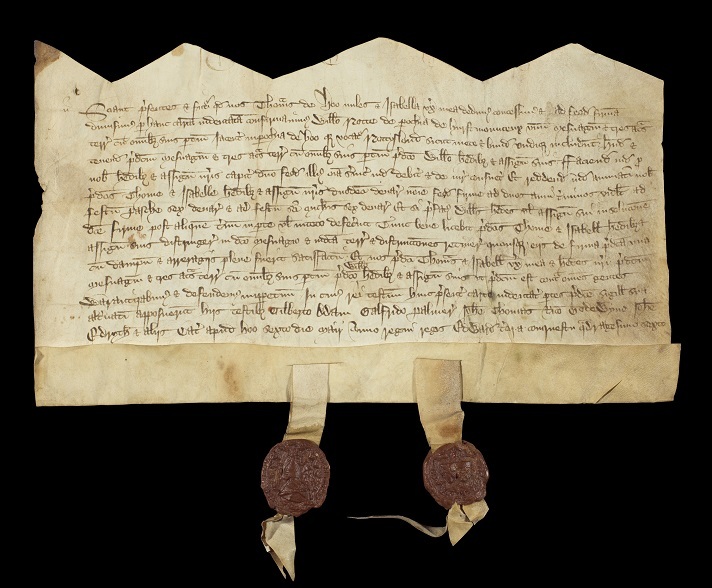 [I am grateful to Jim Poynor for kindly providing the photographs of this charter and its seals.